WNY’s favorite taste of Italy is available to come to you! We have built the facilities to make this long time project become a reality. Now we will be able to serve all our customers who might not be able to make it downtown to Chef’s to enjoy their favorite meal. If you are downtown and can’t make it in…or working outside of the city and don’t have time to come to the restaurant, we’re just a phone call away! Email or call us now at 716-856-9187 to set up your catered event. Our buffets are delivered hot and set-up in displayable disposable containers If there is an item or service you do not see, but wish for us to provide, please ask, we would be delighted to accommodate all your requests. Price Includes: Bread, Butter and Cheese. Plastic Silverware, Plates and Napkins. Cake products available at an additional charge. 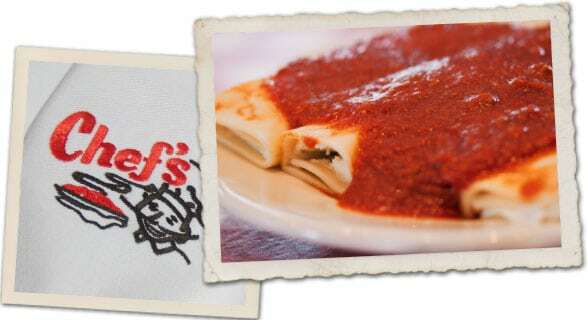 All pasta dishes are served with our “Signature Meat Sauce” unless plain or marinara sauce is specified.